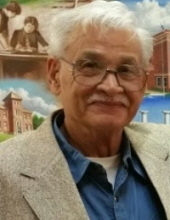 Carthage, MO – Rex R. Wheeler, age 77, of Carthage passed away on Monday, June 18, 2018 at Webb City Health & Rehab. He was born on September 20, 1940 in Carthage, Missouri to Andrew Calvin Wheeler and Loyce Wormington Wheeler. Rex was an electrician for Hercules for many years, loved to hunt, fish, and basically anything he could find to do outdoors and he loved his dogs. Rex was a huge Webb City sports fan, especially when it came to football, wrestling and softball he would attend any game he possibly could. He married Cheryl (Tabor) Wheeler on May 10, 1963 in Webb City and she survives him at their home. Rex is also survived by his daughter, Kristy Rogers and her husband Brad of Webb City; son, Randy Wheeler of Joplin; brother, Leroy Wheeler of Joplin; sister, Sandra Sue Cole of Carthage; grandchildren, Zechariah Wheeler, Aeddan Wheeler, Kailey Rogers, Garrett Rogers, Sonja Wheeler, Danielle Tilton; and one great grandchild, Ebin Wheeler. The family will have a graveside service at 1:00 PM on Friday, June 22, 2018 at Ozark Memorial Park Cemetery in Joplin.